This species is distributed in the Ozark Province of the Mississippi Interior Basin drainages of Arkansas, Missouri, eastern Kansas, and (possibly) northern Louisiana. 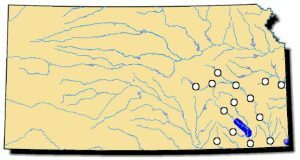 It is known from the Current and Little Red Rivers in Arkansas and various sites in Oklahoma. Comments: The Ouachita kidneyshell is an Ozarkian mussel that only occurs in a small portion of four states: Kansas, Oklahoma, Arkansas and Missouri. The shell is flattened, heavy for its size and kidney-shaped. The greenish-yellow external shell typically has several distinct fine-lined green rays radiating outward from the umbo. It can be mistaken for the spike mussel, especially where the two co-exist. See pages 8-9 for a detailed account of Ouachita Kidneyshell reproduction. 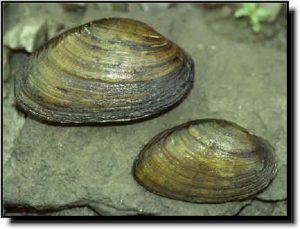 This mussel is mainly found in riffles and shallow runs within the Fall, Verdigris and Spring rivers. Relic shells only are found in the Neosho River.